I went over to her cute shop where not only was greeted by a kind fashionable person but was also greeted by racks of clothing with beautiful patterns and designs! Not only does she have dresses but leggings, bottoms, and tops! Think of a style.. Or a pattern... Well Corin will pick out a outfit or piece from her LuLaRoe shop and have something for you! Of course I went straight to her dress section and started picking out tons and tons of dresses, I also took peaks of other items but like I said... I LOVE DRESSES ! 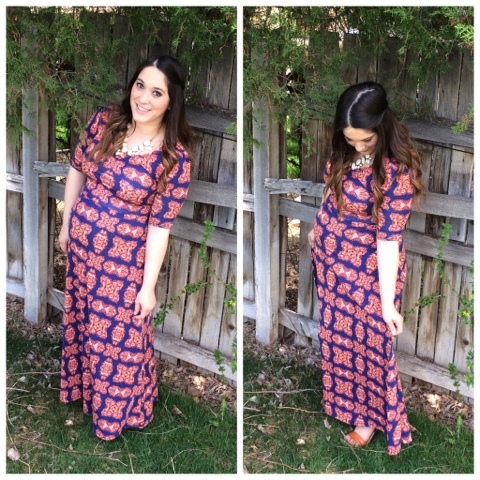 I choose a few items and quickly found my favorite .. Plus my baby bump looked great in it! If you're looking for a fun stylish clothing line and want to go through the shopping process with a sweet friendly consultant then LuLaRoe Corin is for you! Be sure to enter my giveaway that I am doing with LuLaRoe Corin to win a free outfit! All you have to comment below saying you would love to win.. And for extra entries follow me on Instagram at @vallyriches, find the post, and tag your friends (tag one friend per comment) Also don't forget to check out Corins Instagram to see more clothing pieces @lularoe_corinjanell! Can't wait to announce the winner Thursday ! How cute are you?! Seriously love this dress on you, you look amazing! I love Lularoe, they have the best stuff!